The requirements listed below are those necessary to qualify for a diploma from Lawrence Academy. These are the minimum requirements, and Lawrence Academy believes that students should strive to exceed these requirements. 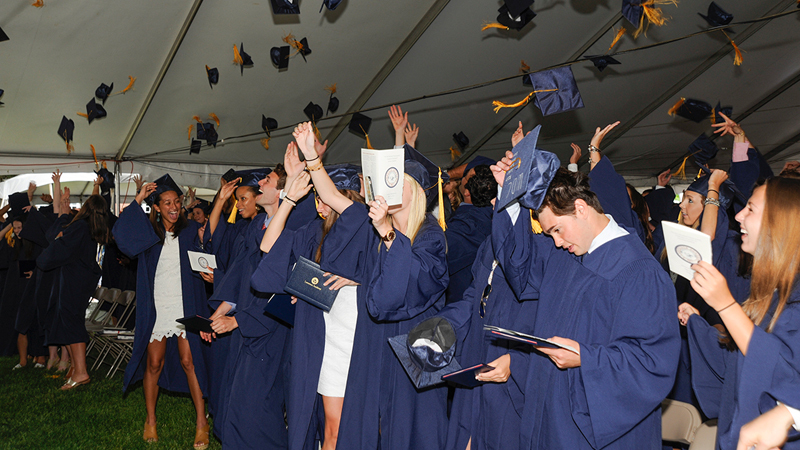 Also, college entrance requirements often exceed Lawrence Academy’s diploma requirements. Complete a year of English for every year at Lawrence Academy. Complete two consecutive levels of any one language (French, Spanish, Latin, or Chinese), regardless of the level at which the student begins their freshman year. Incoming 9th grade students: Complete physics, chemistry and biology. Students entering after the 9th grade: Complete chemistry and biology. Incoming 9th grade students: Complete 2 years of art, one of which must be Artistic Expression. Students entering after the 9th grade: Complete the equivalent of one term of art for each year attending Lawrence Academy, i.e. a term course each year they are enrolled. Students entering Lawrence in the English as a Second Language program are expected to spend only two years in the program if they enter at the ESL intermediate level ESL Literature and ESL Skills count as English credits. ESL Sociocultural Studies and ESL Bridge History course as history credits. After students are placed in the mainstream curriculum, they must meet the department requirements whenever possible. Non-native English speakers will not be given foreign language credit for their native language. Complete a two-week Winterim for every year at Lawrence Academy. Complete six hours of community service for every year at Lawrence Academy.